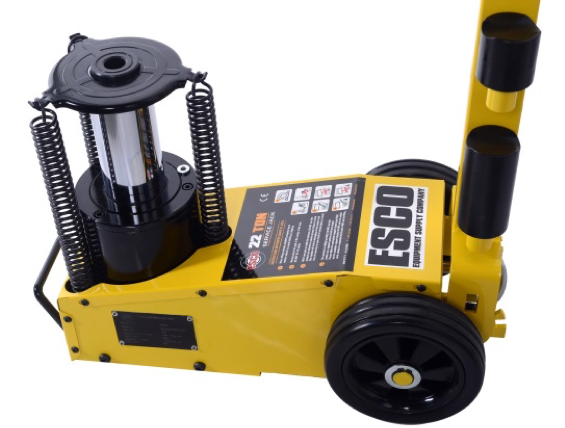 Brooksville, FL – ESCO (Equipment Supply Company) proudly announces their New 22 Ton ESCO Professional Air Hydraulic Service Jack (MODEL 10390). This jack is uniquely designed to meet and exceed expectations of a quality jack at a competitive market value. Unlike other jacks in the market, the Model 10390 is fully pneumatic and is designed based on years of research and reengineering. This jacks 3-Spring Design allows for much more controlled ascending and descending of the cylinder. Cylinder casing has been redesigned, along with the cylinder, to decrease the ability for debris to get into the cylinder and damage the jack. Redesigned Air Pneumatic Design allows for the jack to ascend with air and descend with air. No more manual descending of jack. 3-Spring design also better stabilizes the cylinder which prevents unnecessary movement of the cylinder while lifting the vehicle. Jack has a maximum lifting height of 21.35 in. and is a portable, lightweight design. The New ESCO 22 Ton Professional Air Hydraulic Service Jack (MODEL 10390) is available now wherever ESCO products are sold. For more information about this product and where to buy ESCO product email sales@esco.net or call 1-800-352-9852. For over 30 years, ESCO has been the world leader in quality hydraulic tire changing tools and accessories for the Commercial Truck, OTR, Mining, and Agricultural Market.